Virtual Masters owns and operates our private data centers. By owning our data centers rather than leasing, we are able to design, build and maintain an ideal server environment. This allows us to provide our clients fast, secure and reliable performance at all times. 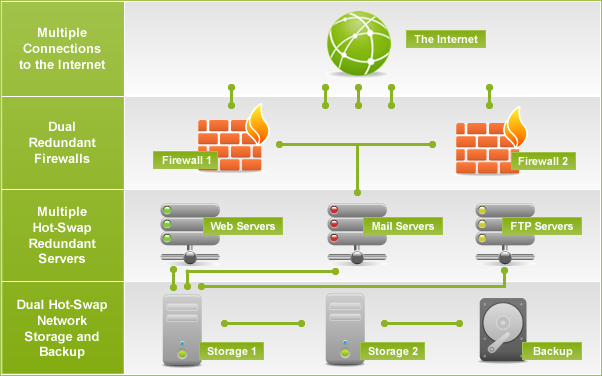 The following diagram represents the Virtual Masters web hosting infrastructure. Redhat and CentOS are the leading provider of Linux open source software. For many years now Redhat and CentOS Linux have been the number one choice for web hosting companies, not just because of Redhat's amazing scalability but also because of its track record as the most stable operating system available in the market today. Unlike many of our competitors, we run Redhat Enterprise Linux, the most stable release of Redhat Linux available and the only version that keeps completely up to date with security patches.